Wonderful boutique hotel. Best possible accommodations for couples retreat. comfortable bed. good air conditioning. clean room. excellent breakfast. comfortable pool loungers. large room. staff had car rental company bring the car to us. One of the best hotels I've ever stayed at. 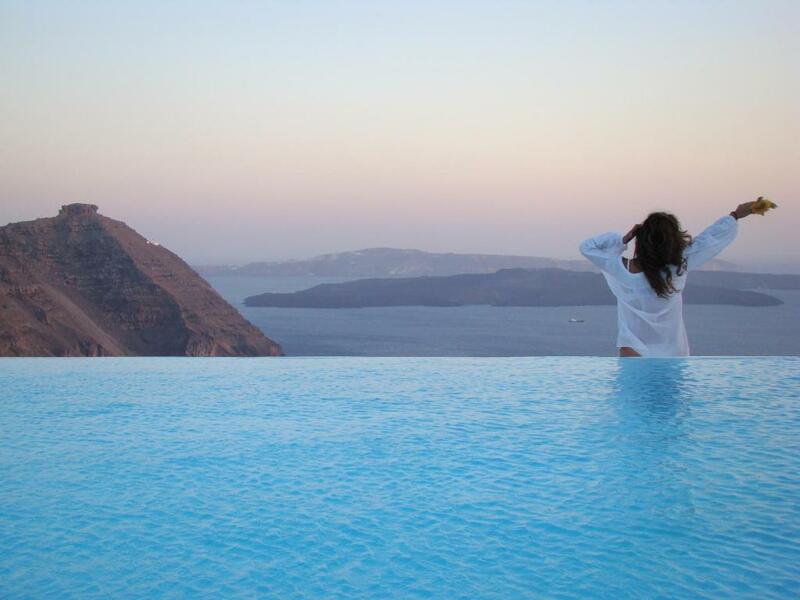 Although those incredible views of the caldera can be seen throughout many locations in Santorini, what sets this hotel apart from the others is the exclusiveness of its location (between Oia and Imerovigli) the peace and quietness lets you enjoy the great infinity pool and take it all in. The staff are amazing! They were so welcoming it felt like I was visiting lost lost family. Right from check in to check out they always had a smile, always willing to help or assist and very attentive without being intrusive. Room was cleaned twice daily and always left spotless, Welcome gift was a nice touch also. I cannot speak highly enough of this hotel. Quiet & private! Service is personal, attentive & warm. Villa & rooms are beautiful & clean! The hotel is just beautiful..modern and exceptionally clean and bright...glorious views from just about everywhere ...delicious breakfasts...NOTHING is too much trouble for the owners and their lovely staff...great walks into Fira or Oia...or if quiet time is what is needed the hotel pool area won’t disappoint. The interior styling was superb. The view of the caldera was breathtaking. the personal touch from check-in to restaurant recommendations was fantastic. most amazing view, perfect staff , feels like home! Perfect for honeymoon , really calm and private! Just the most beautiful boutique hotel with excellent staff. 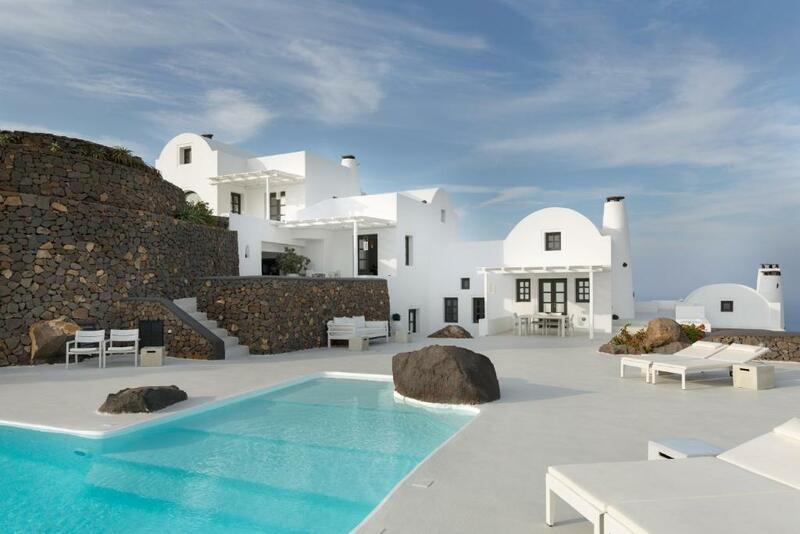 Perfect for a relaxing stay away from the tourist traps of Oia & Fira. Couldn't recommend it more highly! The little extras - free fruit, iced water & wine only added to the experience. Lock in a great price for Aenaon Villas – rated 9.9 by recent guests! 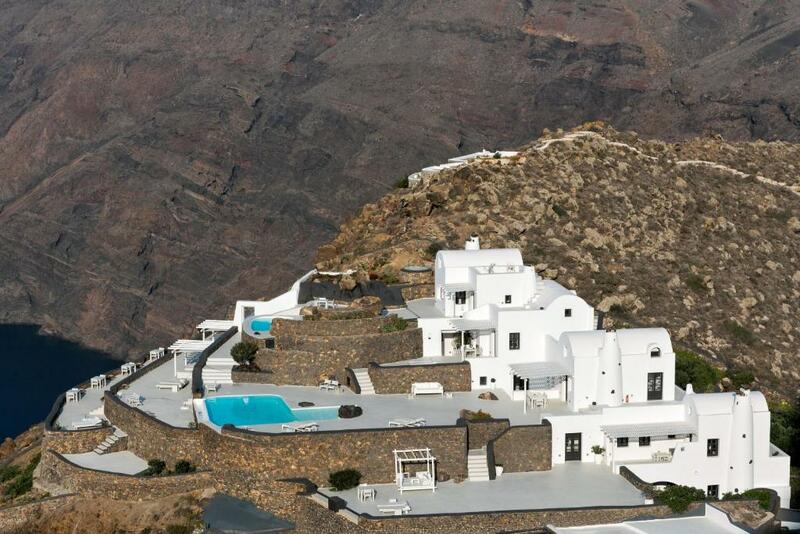 Aenaon Villas are situated at the highest and narrowest part of Santorini, right on the edge of the world-famous caldera, and are open to all four points of the horizon, from east to west. 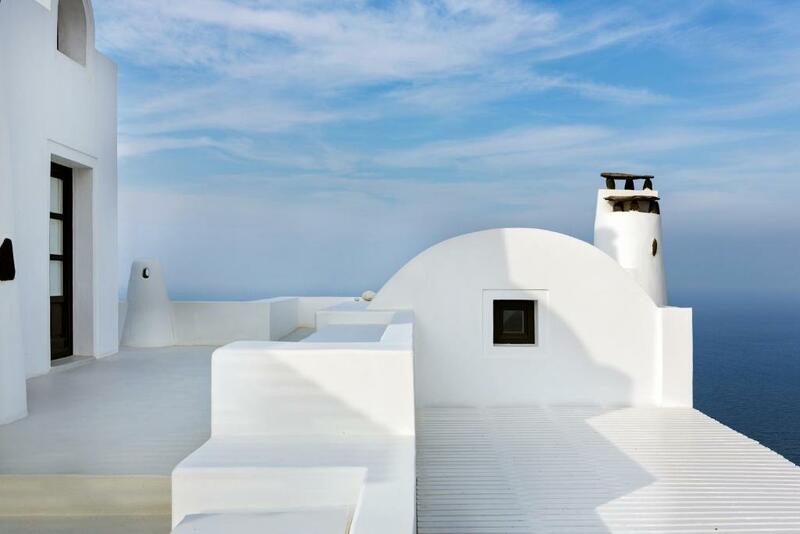 The villas’ exterior is built in a traditional style, according to Cycladic architecture. Each offers a separate living room and dining room, equipped kitchen, bathroom with shower and private porch. Some feature a fireplace. Guests are served Greek, continental or breakfast each morning. Private porches provide access to the infinity pool, which is built on the caldera’s edge and offers views of the Aegean Sea, the caldera, the volcano and the unique sunset. When would you like to stay at Aenaon Villas? Featuring a private pool, this spacious and split-level villa comes with an attic-style bedroom, a living-dining room with fireplace and a bathroom with a shower. Spacious and secluded porch with a view of the caldera. Please note that this villa cannot accommodate an extra bed. Spacious villa with living room, kitchen-dining room, bathroom with a shower, fireplace, private porch with a view of the Aegean Sea. Spacious villa with living-dining room, bathroom with a shower, spacious private porch with a marvelous view of the caldera. Large villa with a master bedroom and 2 additional bedrooms, spacious kitchen, spacious living-dining room, fireplace, spacious porch at the same level with the infinity pool, with view of the caldera. Spacious villa with living-dining room, bathroom with shower, fireplace, porch with view of caldera. House Rules Aenaon Villas takes special requests – add in the next step! Aenaon Villas accepts these cards and reserves the right to temporarily hold an amount prior to arrival. Please inform Aenaon Villas of your expected arrival time in advance. You can use the Special Requests box when booking, or contact the property directly using the contact details in your confirmation. despite the awesome room, pool, views, and breakfast, it is still priced very high. Other hotels at this price would provide poolside snacks and drinks with this price but we were asked to pay for these extras with cash. My partner and I chose Aenaon Villas for our first stay in Santorini and we are so glad that we did! This hotel felt like we woke up in a dream every single day! This hotel is stunning in absolutely every way, every inch of this hotel is a picture perfect. The pool area is straight out of a painting! The owners and staff here are some of the kindest people we have ever met, they are so genuine and warm. Maria at the front desk is so lovely, willing and happy to assist in any way that she can with a smile on her face, she even assisted us to take some lovely photos for our Instagram! My partner and I are vegan and this hotel went above and beyond to cater for us. Each night you simply fill in a breakfast form by ticking the options you would like for breakfast and where you would like to eat breakfast (by the pool, at your room etc). We were encouraged to write down whatever we would like at breakfast (potatoes, mushrooms, etc) and they delivered! We were very satisfied. The hotel also assisted us with our car rental which was hassle free! I would absolutely recommend this hotel to anyone! Go here! You won’t regret it!! THE BEST ACCOMMODATION OF MY LIFE...I really enjoy staying at Aenaon Villas thanks to the location, we landed very late at night and they wait for us for a personal and friendly check in with an amazing view on the Caldera. We stayed at the nice and comfortable Villa Zanneti, we slept and rested so well there. The cleaning lady, Claudia, is so efficient and discreet, she put my clothes on the wardrobe without asking for it...like having mom with you hehehe. Valentino is their SUPERMAN, he is running all the time to bring you some fruits on the pool or prepare the best breakfast of your life with this exceptional view on the Caldera. Efigenia at the reception was so helpful to rent a car (with very good prices) and provide some good tips or recommendation to avoid the touristic areas...Thank you to all the staff. A special and warm thanks to George and Alexandra, they create a very friendly ambiance on this part of Santorini with unique Modern White Villas so peaceful and quiet. Perfect place on Earth or so it seems. I will definitely come back there one day. Toilets were pretty standard affair for a high-end place. could do much better. Our stay at the Aenaon Villas (Villa Elidami) was absolutely incredible. Alexandra and George were the most gracious hosts. We arrived late in the evening and we were welcomed with a bottle of Santorini wine and fresh fruit. After asking for a recommendation for a quick dinner nearby, Alexandra instead brought us sandwiches and appetizers so that we could relax, enjoy our first Santorini sunset and settle in after a long day of travel. The Aenaon Villas are impeccable! Everything is well thought-out from its design to layout. With many shared spaces, it still feels as though every villa on the property has its own unique and private area. The infinity pool is one of the best in Santorini, with plenty of places to lounge poolside. We found that the location of Aenaon Villas is one of its best attributes. Located in a quiet section of town with the main road behind the property and easy access to the walking path allowed for ultimate privacy. The center of the town of Imerovigli is only a 5 minute cab ride away. 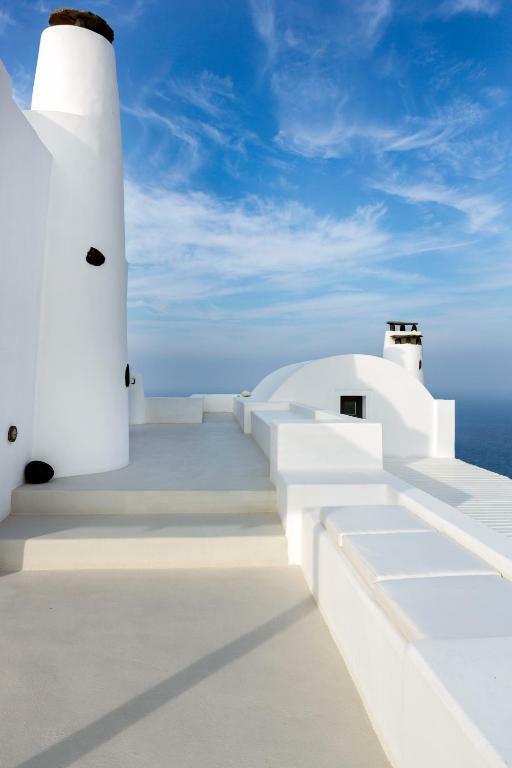 Aenaon Villas is located at one of the highest parts of Santorini with unobstructed views of each side of the island, allowing for sunrise and sunset views with Oia in the distance. Nearly all of the villas had both east and west facing terraces. Aside from the aesthetic of the property, we were blown away by the attentive service. Alexandra offered and arranged some of the best recommendations. Both Alexandra and George went above and beyond to ensure we were comfortable and enjoying every minute of our stay. The staff was warm and welcoming. From bringing us a delicious breakfast poolside every morning, to water and fresh fruit to enjoy by the pool, they even made us fresh fruit smoothies one day! The service was exceptional. 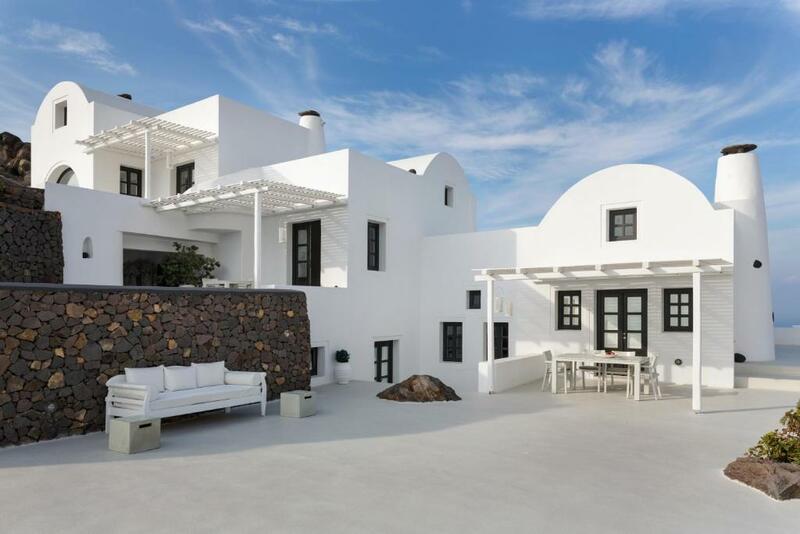 Bottom line, if you are looking for a place on Santorini that is intimate, peaceful, and beautiful without sacrificing any of the views or experiences that the island has to offer, Aenaon Villas is the choice for you.